The whole K11 family group was traveling in a tight group together. While you can't see all the saddle patches for IDs in the photo below, I had a whole sequence of photos of them surfacing and was able to piece together who was who. 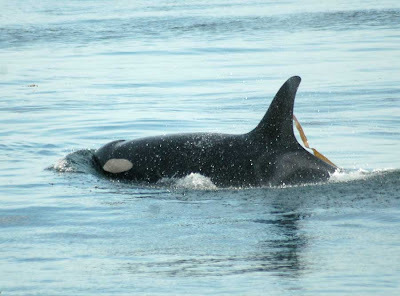 What I really like about this shot is you can actually see Skagit and all four of her offspring together. 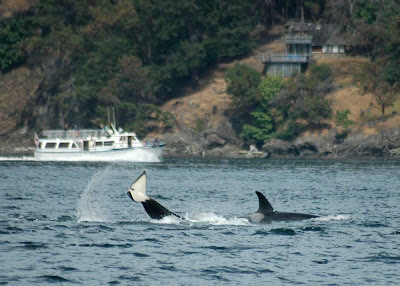 From left to right, the whales in the photo below are K34 Cali (8 year old male), K25 Scoter (18 year old male), K27 Deadhead, (15 year old female), K20 Spock (23 year old female), and K13 Skagit (37 year old mother of the group). Remember how I saw the whales in front of a freighter the other day? 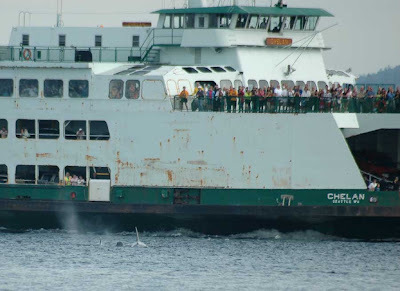 Today, a Washington State Ferry stopped to watch the whales. You can see a few of them surfacing in front of the ferry in the photo below - click to see a larger version. 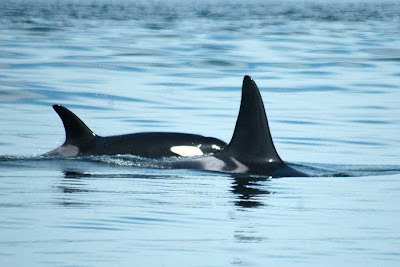 It's crazy how they were swimming towards such a large vessel that was at that time still moving! 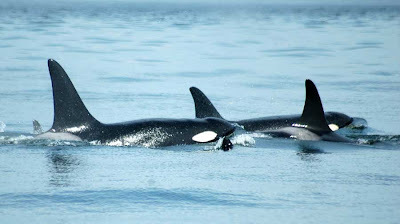 Right before we left, Ks started to meet up with at least some J-Pod members as we saw J1 Ruffles, but there wasn't an explosion of activity at the surface that we thought we might witness as the pods met up after being split apart overnight (sometimes there's lots of active socializing when the pods reunite). Also, today on the Prince we had a few visitors from The World, a 12 story, 644 foot cruise ship that is owned by the residents that live aboard it. Some people stay onboard year round, while others come and go from their floating private condos, joining the ship in different ports and sailing for weeks or months at a time. As its name suggests, the ship sails around the world, spending only a few days in each port before moving on. In the rest of 2009, it will travel up to Alaska, through the Bering Sea, down the Russian coast and through Japan and past some Pacific Islands before ending up in Australia in December. Remarkably, this huge ship carries only 250 crew and no more than 330 live-aboard residents, usually less. 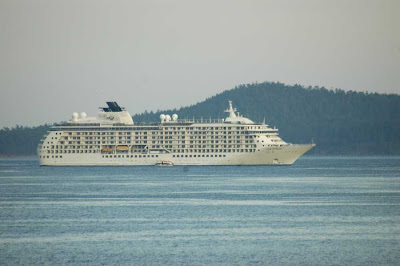 The vessel is so large that it has to anchor in Griffin Bay, a 30 minute tender ride to Friday Harbor for its residents. It's hard to appreciate just how large this ship is without anything to directly compare it to, but right alongside the ship is one of its tender boats that can carry up to 50 people. When we stopped to take a few photos of the ship (it moves on tomorrow), there were many other island residents doing the same. Your having a whale of a time at the moment! And that great great great grand mother - 98 years old - wow what changes she has seen in the ocean - hope she is able to pass on here 'history' to the youngsters somehow. 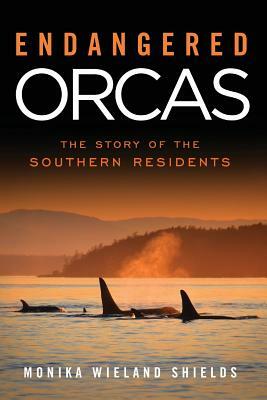 thanks, monika, for all the updates on the orcas. i'm really glad they are hanging about so much and am hoping they will still be hanging about late summer/early fall when i hope to get back up there! until then, i visit them vicariously through you! !